I met this six year old child...with the blackest eyes. The Devil's eyes. If the criteria for a horror classic includes how well the film holds up after repeated viewings, the scare factor, solid acting, the effectiveness of its score, an original directorial style and photography, well, then Halloween hits it out of the ball park. Director John Carpenter has called his work Halloween "an old country fair haunted house movie" in which all the scares are skillfully "programmed." Carpenter was first approached by Executive Producer Irwin Yablins to direct a project tentatively titled The Babysitter Murders. When Yablins came up with the subsequent idea to have the film take place during a 24 hour period (a money saving option) and set it during Halloween, Carpenter knew exactly how to make it work. He collaborated on the screenplay with Debra Hill, Script Supervisor and Assistant Editor on his previous feature, Assault On Precinct 13. Together, they came up with a list of scares which they weaved into the story. 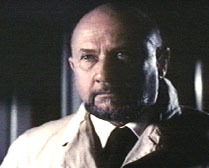 Although they originally wanted Christopher Lee or Peter Cushing to play psychiatrist Sam Loomis (named after a character in PSYCHO) they were pleasantly surprised when Donald Pleasence accepted the role. In casting the female lead, Carpenter and Hill found that Jamie Lee Curtis had the fresh quality they were looking for. The fact that she was Janet Leigh's daughter connected the film back to the Hitchcock classic and sealed the part for her. It's 1963 in sleepy Haddonfield, Illinois. Halloween night. A young boy named Michael Myers (Will Sandin) watches from outside his house as his sister Judith (Sandy Johnson) and her boyfriend (played by David Kyle) are making out on the sofa. 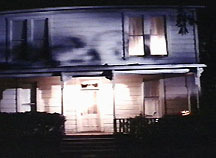 The couple go upstairs to Judith's bedroom, while Michael grabs a large knife from a drawer in the kitchen. The boyfriend leaves and the boy dons a masquerade mask. He then enters his sister's bedroom and brutally stabs her to death. Michael runs outside, where his parents (who have just returned from a night out) take the mask off. 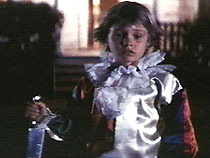 Standing with the bloody knife in his hand, the boy looks stunned and disturbed. Cut to a rainy night in Smith's Grove, 15 years later. It is October 30th and Michael's psychiatrist Sam Loomis (Donald Pleasance) and Nurse Marion Chambers (Nancy Stephens) are driving towards Illinois State Hospital, where the killer has been incarcerated. Dr. Loomis tells the nurse that the young man hasn't spoken a word since he was brought in and should not be underestimated. Michael is due for a hearing before a judge - but Loomis is determined that he not be set free. As they get closer to the facility, they notice that the inmates are walking around on the grounds. Loomis tells Nurse Chambers to pull up to the main gate and while he tries to call security, Michael (played by Nick Castle for most of the film) jumps on top of the car and attacks the nurse. She manages to crawl out and Myers escapes by driving away in the hospital vehicle. "He's gone from here. The evil is gone!" Dr. Loomis screams. A little boy named Tommy Doyle (Brian Andrews) stops Laurie and asks if she's going to babysit him that night. "Sure," she says. They plan to watch monster movies, make popcorn and carve a pumpkin. Needless to say, Tommy is thrilled. Laurie puts the key under the mat in front of the abandoned house and the boy tells her she shouldn't go near it because it's "haunted." Someone is watching them from behind the front door. Back at the State Hospital, Dr. Loomis tells Dr. Wynn (Robert Phalen) that Michael is probably heading back to his hometown. Dr. Wynn thinks that is unlikely...since Haddonfield is 150 miles away from the facility. In her classroom, Laurie sits by a window and sees an eerie figure standing across the street staring at her. She answers a question from the teacher and when she looks out again, the person is gone. The school day is over for Tommy and he's carrying his pumpkin for the evening. 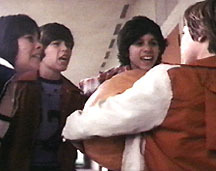 A couple of kids tease him, telling him the "boogyman" is going to get him. The bullies trip Tommy and the pumpkin smashes on the ground. Tommy's tormenters run off and one of them bumps right into Michael Myers. As Tommy walks home, Michael follows him in the car he stole from the nurse. Dr. Loomis calls the authorities in Haddonfield and tells them about the escape, warning them that a killer is on his way. Near an abandoned truck, he finds a matchbook that belonged to the nurse and realizes his worst fear is correct. What he doesn't see is the body of a man in the bushes who was killed by Michael...his uniform stolen. Laurie leaves school with her friend Lynda (P. J. Soles), who tells her it's her own fault she has nothing to do that night. Annie (Nancy Loomis) catches up to them and complains that she'll be unable to see her boyfriend Paul because he was caught "throwing eggs and soaking windows." She's set to babysit in the evening as well. Laurie realizes she left her chemistry book at school and notices Michael following them. Lynda thinks it's someone they know and Michael drives off before they can get a good look. "Hey, jerk...speed kills," Annie yells at him. Michael abruptly stops the car, creeping the girls out. "God, can't you take a joke?" Annie adds in a low voice. They continue to walk along the treelined streets and past the modest homes. Lynda needs a place to spend some time with her boyfriend Bob that night and Annie says she can come over to the Wallace's place...where she will be babysitting their daughter Lindsey. Lynda arrives at her house and Laurie catches a glimpse of Michael Myers standing near some bushes. Annie goes to investigate and he disappears. "Poor Laurie...scared another one away," Annie tells her virginal friend. 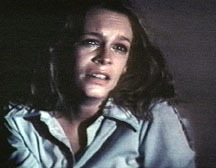 Laurie continues to look towards the bushes and is startled by Annie's father, Leigh Brackett (Charles Cyphers), who happens to be the Sheriff. "You know it's Halloween. I guess everyone's entitled to one good scare," he says. Outside her house, Laurie sees several children trick or treating and realizes how ridiculous she has been with her paranoia. However, she goes up to her bedroom and once again sees the masked figure - this time standing in her backyard. Frightened, she backs away from the window. The phone rings and no one is on the line. 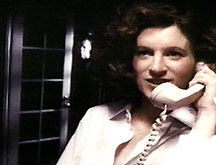 Laurie hangs up and the phone rings again. Annie tells her she didn't speak the first time because she was chewing food. In the early evening, Laurie leaves for the Doyle house with a pumpkin for Tommy. Annie picks her up in her car and they light up a joint. On their way to their babysitting chores, Annie tells Laurie that she and Lindsey Wallace will be watching six hours of horror movies...unaware that Michael is following them. She catches sight of her dad outside of a hardware store that has been broken into. They quickly put out the joint and Sheriff Brackett tells them that a mask, rope and a couple of knives were stolen - probably by "kids." Meanwhile, Dr. Loomis visits the cemetery where Judith Myers is buried. 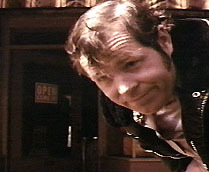 He's lead to her grave by a graveyard keeper (played by Arthur Malet) and they discover that the tombstone is missing. "He came home," Loomis says. The doctor finds the Sheriff and tells him he needs to speak with him. He just misses seeing his patient drive by in the stolen car. Michael Myers continues following the girls as they talk about the dance the next night. Laurie, ever the shy bookworm, is upset because she doesn't have a date. It's nightfall when they arrive at the street where the Doyles and the Wallaces live - and the two friends go their separate ways. Michael parks his car on the darkened street and watches Annie. Dr. Loomis and Sheriff Brackett take a look at the old Myers house and find evidence that someone or something was there - a partially eaten dog. "A man couldn't have done that," the Sheriff says. "This isn't a man," Loomis tells him. The doctor gives the background to his association with the boy who killed his sister a decade and a half before. He says he spent eight years trying to reach Michael Myers and another seven making sure he stayed locked up. Dr. Loomis is convinced his patient will return to the house and tells the Sheriff he's going to hang around. Giving some rather ill-conceived advice, he also warns against letting the residents know there's a killer in their midst. Laurie starts off the night by reading a book about King Arthur to Tommy. The boy is bored and pulls out some more intellectually stimulating materials - comic books with titles such as "Laser Man," "Neutron Man" and "Tarantula Man." Just as Tommy brings up the subject of the boogyman, Annie calls Laurie. She tells her she had a talk with the guy Laurie has a crush on and he might take her to the homecoming dance. Lindsey (Kyle Richards) is enraptured by the television...while her dog Lester is agitated by something outside. Tommy goes to the window and sees a shadowy figure standing in front of the Wallace house across the street. He's convinced it's the boogeyman and tells Laurie. Of course when she looks out, there's no one there. The two girlfriends get off the phone when Annie spills butter on her clothing. Michael Myers watches as she changes into an oversized shirt. The dog goes out and barks at him but is quickly snuffed out. Laurie sits down to watch the original The Thing on the TV. Tommy cannot stop talking about the boogeyman because Ritchie said he was coming after him that night. "Tommy, Halloween night is when people play tricks on each other. It's all make believe. I think Ritchie was just trying to scare you," Laurie tells him. To ease the boy's mind, she carves the pumpkin with him. Annie goes into the laundrey room, unaware she's being stalked. She gets locked in and calls out for Lindsey. Her boyfriend Paul (the voice of John Carpenter) calls and she gets stuck in a window while trying to climb out. Lindsey helps her and Annie goes back to the house. Paul calls again and says his parents have left. He asks her to pick him up so Annie drops Lindsey off with Laurie. She tells her friend she'll talk to her in an hour. Annie's car doors are locked and she has to go back into the Wallace house to get the keys. When she returns to the garage, the car is suddenly unlocked. Before she can react, Michael grabs her neck from the back seat and chokes her before slashing her throat. Tommy plays a prank on Lindsey by calling out her name from behind a curtain. However, the joke is on him when he turns around and sees the boogeyman carrying Annie's body out from the garage and into the other house. He screams and Laurie tells him to stop scaring Lindsey. Dr. Loomis has some fun at the abandoned Myers home when a group of kids dare each other to go into the house. He scares them away and is startled himself when the Sheriff comes up behind him. Sheriff Brackett tells him nothing unusual has happened in the area. Loomis is not swayed, saying "death has come to your little town." Lynda and Bob (John Michael Graham) show up at the Wallace house looking for a bedroom to do the nasty. The lights are out and Annie is nowhere to be found. The couple make out on the couch with no idea they're being watched. Laurie has carved the jack o'lantern with the kids. She looks out the window and sees how quiet the house across the street looks. "Everybody's having a good time tonight," she says to herself. Lynda calls her and asks if Annie is with her. Believing her friend is out with Paul and knowing that Lindsey is staying with Laurie...Lynda is thrilled she and Bob have the entire house to themselves. They go up to one of the bedrooms for a good time. During a cigarette break, Bob goes downstairs to the kitchen to get some beers. He hears something and opens a closet door, thinking Lynda is hiding out. Suddenly, Michael grabs him by the throat and lifts him up against a wall. Bob is no match for the killer and Michael jabs a knife into his stomach, impaling him on the wall. Lynda is sitting up in the bed, waiting for her man. 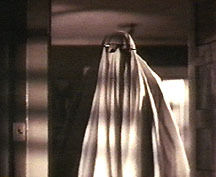 The bedroom door opens and she sees "Bob" standing with a sheet over his body. His eyeglasses are over the disguise. She teases him by saying things like "see anything you like?" and "can't I get your ghost?" When Lynda doesn't get a response, she gets irritated and calls Laurie to find out where Annie and Paul are. Michael comes up from behind and strangles her with the phone cord. Laurie hears her gasping and naturally thinks it's a prank. Annie doesn't say another word and Laurie becomes worried. She checks up on Lindsey and Tommy (who are both sleeping) and then heads over to the other house. 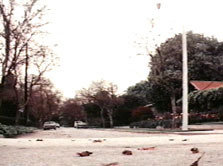 Dr. Loomis, who has been standing outside the Myers place, suddenly glances over to the street and sees the car that was stolen by Michael. The streets are now deathly quiet as Laurie tries to find out where Annie, Lynda and Paul are. The front door to the Wallace house is locked so she enters through a back door. She calls out their names but there's no answer. Laurie goes up to the second floor, where she sees a light coming from one of the rooms. She opens the door and sees a ghastly sight. Annie's body is layed out on the bed with Judith Myers' tombstone behind her. Laurie is horrified and can barely scream. She backs into a closet and Paul falls out, hanging upside down. She then sees Lynda's corpse in a linen closet. Laurie dashes out of the room and into the hall. Michael Myers appear out of the darkness and slashes her arm with a knife. Laurie falls over the railing and lands at the bottom of the stairs. She sees him coming after her and tries to get out the front door. It's jammed so she runs into the kitchen and makes it out the door just in the nick of time. Once outside, she screams for help but no one bothers to come forward. One resident deliberately ignores her plea and shuts the blinds. Finally, Laurie makes it to the Doyle house but can't find her keys. The kids are fast asleep so she throws a potted plant up towards the bedroom window to get their attention. Michael is only several feet away from her when Tommy opens the door. Inside the house, Laurie yells at Tommy to go upstairs into the bedroom and lock the door. She turns off the lights and discovers that the phone is dead. A side door was open the entire time and Laurie crouches next to the sofa in the living room. She grabs a knitting needle for protection and Michael tries to stab her. He barely misses and Laurie jabs the needle into his neck. 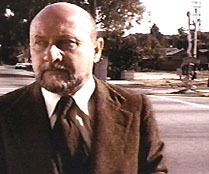 Dr. Loomis is wandering around the streets and sees Sheriff Brackett. He tells him he found the stolen car and that the officer should go around the back of the houses while he searches the front areas. Laurie tries to comfort the children by telling them she killed the boogeyman and suddenly he appears behind her. Tommy and Lindsey lock themselves in the bedroom while Laurie pretends to climb out of the house by leaving the windows open in the next room. She hides in a closet but Michael figures out her ruse. As Michael breaks through the closet door, Laurie pokes him in the eyes with a wire hanger. Michael drops his knife and Laurie stabs him with it. Dr. Loomis sees the two kids running and screaming in the street. He enters the Doyle house and fires several shots at Michael, who falls off a balcony and to the ground below. "It WAS the boogeyman," Laurie cries. "As a matter of fact it was" is the doctor's answer. When Loomis looks over the balcony, Michael Myers is gone. Filming took place over the course of twenty days in the spring of 1978, at a budget of $300,000. An upscale neighborhood in Pasadena, California was the primary location used and it's interesting to note how the town appears to be more middle class on film. In fact, Halloween is filled with in-jokes and references. 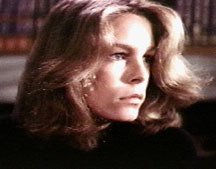 While Haddonfield was named after the New Jersey town where Debra Hill graduated high school, Laurie Strode was the name of Carpenter's first girlfriend. 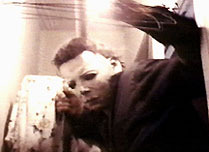 Michael Myers was named after Carpenter's British distributor, who was instrumental in supporting Assault On Precinct 13. The cast and crew apparently had a ball making a film that would eventually spawn countless imitations over the years. From Carpenter: "Whenever you make a horror movie, you have a great deal of fun. If you make a drama or a comedy, it's a nightmare. It's ugly, it's horrible. Because [of] the subject matter...everybody gets very serious." He adds that with a horror film, "everybody starts loosening up, and the more blood you bring out, the more fun it is. The more people get killed - the crew is laughing and joking. It's like a picnic. That whole feeling was rolling through Halloween." The film, made on a modest budget, would end up grossing upwards of $80 million worldwide. For years it stood as the most financially successful independent film ever made. Michael Myers' signature mask could have very well been a clown face. Luckily, the prop department discovered an old "Captain Kirk" Star Trek mask originally intended for William Shatner. They spray-painted it white, made the eye holes bigger, and teased out the hair. Is it really possible no one had ever done a full feature-length film with a Halloween theme? The only thing that comes to mind is a wonderfully dark vignette in the MGM musical Meet Me In St. Louis, which perfectly captured this holiday. The combination of this most unholy of days and babysitters in jeopardy is as good as it gets. Carpenter's direction and score created a suitably eerie atmosphere, while Cinematographer Dean Cundey's photography should not be overlooked. And the cast? Jamie Lee, P. J. Soles and Nancy Loomis are raw and charming - with Debra Hill having written some authentic "girl talk" dialogue for them. 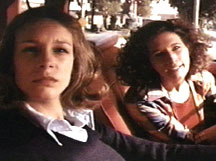 And who can resist Laurie and Annie smoking pot and listening to Blue Oyster Cult's Don't Fear the Reaper in the car? With the atmosphere evoking memories of sleepy Midwest towns, this is and will remain a favorite 'progenitor' horror film, the kind of rare creation that spawns a whole new subgenre. The slow pace of the people, the calm and quiet beauty of the town, and then the crazed killer enters the town and begins terrorizing...simple and masterful! Countlessly imitated in the years following, none can compare to this one.